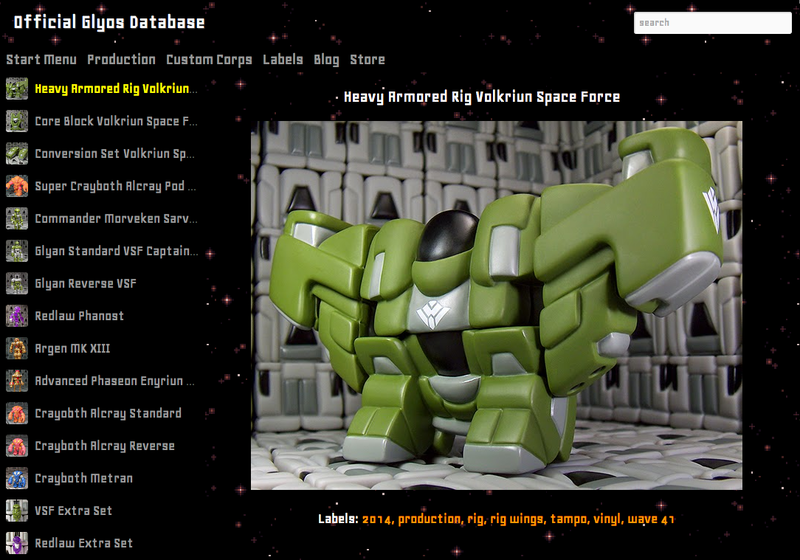 A not-totally-complete but superbly fun Official Glyos Database has launched and you probably need to see it. You won't find all the Custom Corps or promo freebie figures here, but it's a great way to sort and pour over hundreds of figures from over the better part of the last decade. Do go check it out! It's Christmas, so let's look at something that I didn't necessarily originally want. The 60mm Scorpion - Flesh is one of three unpainted figures from the initial runs of these molds, and dagnabbit, it's pretty good. Creator Jon Karis runs LittleRubberGuys.com, which covers the male action toy figures that are too small to be deemed "action figures" by the serious (read: boring) adult collector. It's a wonderful site and a great resource, mostly because this is where you're going to see Japanese capsule figures or American Garbage Pail Kids figures early - it's not wildly active, but it's one of those sites that I personally find informative and useful. The biggest success in that little rubber figure space is, in the eyes of many American fans, Mattel's M.U.S.C.L.E. 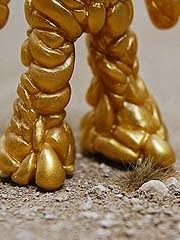 - and this figure (as well as his Rhino companion) are a tribute to that classic line of toy figures. 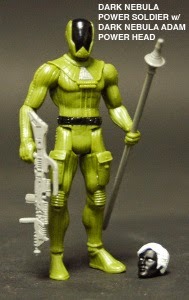 2 New Power Lords Coming - Hope You Love Green! While we have no pre-order dates or prices, there's a post and two store product info pages promoting a pair of new figures. 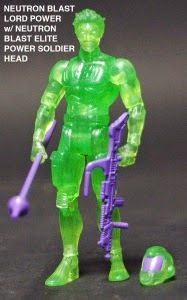 Dark Nebula Power Soldier (left) has a black Adam Power head, while the Neutron Blast Lord Power (right) has an Elite Power Soldier head. The Redlaw Phanost is easily the star of last month's drop, which is shaping up to be the final release of Onell Design's 2014 product offering. The drops have been sticking around the same size over the last few Decembers but they certainly feel smaller - the reduction of Traveler figures to two and the lack of new molds or builds is hard to ignore, and the influence of Glyos impressario Matt Doughty is felt elsewhere. The Onell Design product offering has largely kept to new deco on existing figures, but with new and pretty great paint masks and precious few molds. The Super Crayboth and an alternate new head for Argen are two of this year's big gems, alongside new heads at the 481 Universe, Maxx Zero in Robo Force, the Banimon tank, the amazing Rise of the Beasts line, and others. The pool has certainly grown significantly, even if the founding line has kept it small and safe with a few good figures. Given the increasing size of the playing field, the less-is-more approach is certainly welcome. Not only are we getting new Kabuto Mushi drop on Sunday, but Ni Stuff has holiday goodness on December 19! Details to follow, but this tease on Instagram was tied to a tweet confirming the date. Make plans Friday night. Two posts of interest to you Banimon fans today! #1: October Toys Forums. 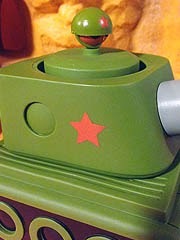 Here you'll see shots of the new green Red Army Men, plus the new T-011 tank in a matching green color. It's quite nice. #2: Banimon Blog - Red Army Men MKII. Not much in the way of pictures, but it confirms the drop is "soon." 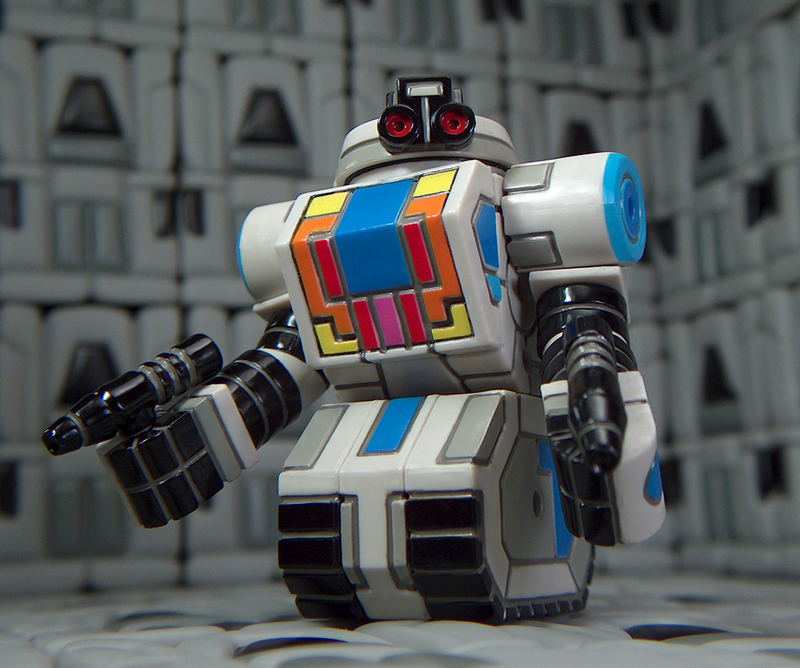 If you pre-ordered a ToyFinity Maxx Zero, you'll want to read this update: "New Mordles page! 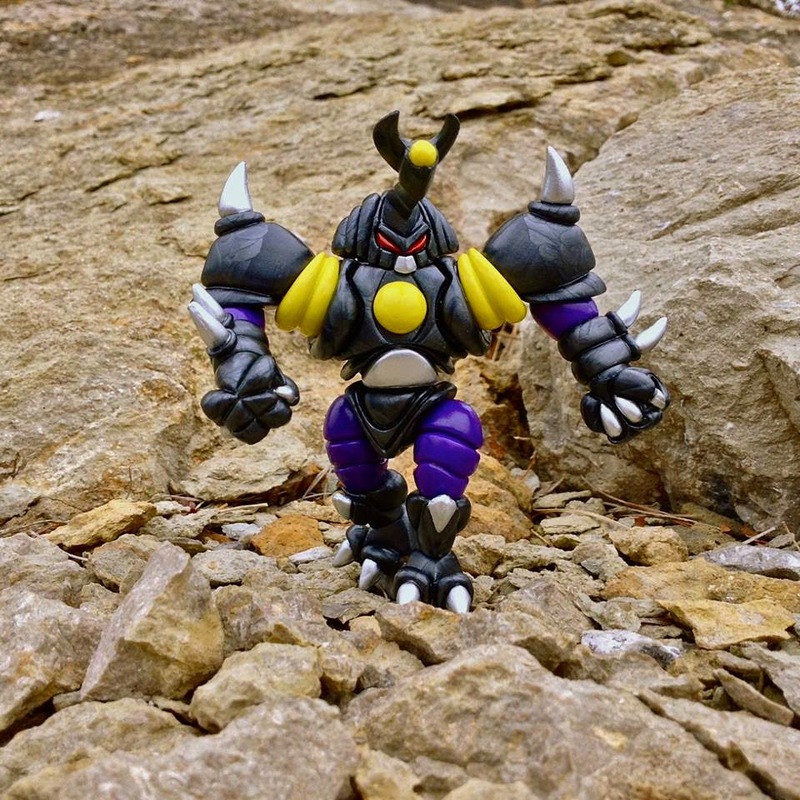 Maxx pre-order update! 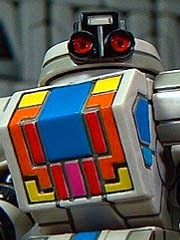 Happy Anniversary Robo Force cartoon! And more... "
The long and short of it: your figures are being tweaked so now they're due around January. If you like inside toy dirt baseball, he also does a great job of explaining why paint bonding to paint is bad, which you have possibly also just read about over at the Four Horsemen's pages. Their Ravens figures (shipping now) are shipping with a disclaimer over heating their joints before use - I usually use boiling water in these circumstances - to avoid breakage. It's funny to see how and why these things happen, and how various companies treat the problems. If nothing else, now you know the why, and the how to fix it if you didn't already! "We’re gearing up for another Power Lords release on Store Horsemen right as we ring in the new year, and the pre-order for those will be going up within the next week or two. Details coming soon here on Source Horsemen." With no specific indication as to the when, the what, or the how much, we suggest you speculate wildly in anticipation of this whatever it is. Two Rise of the Beasts prototypes are on eBay now - they're getting expensive, but they're pretty slick (and I hope they might be the basis of a future mass-produced run someday). Click here for the Scorpion, and click here for the Rhino. Surprise! The great bearded one has returned with a small bounty of new Callgrim figures. Click here for the post, click here for the store. Callgrim Standard MK III is available for $10 (cheep!) and he's jointed by 5 more figures. The Order Standard MK III, Callgrim Stealth MK IV, Callgrim Red Metal, The Order Warp Tank Commander, and The Order Warp Tank Trooper are each $10 and in stock as of my writing this. Again, click here to order yours now. The Callgrim Standard MK III price is a sale for the remainder of 2014. According to this post on the October Toys forums, Marty "TheGodBeast" Hansen has one more special treat in store this year. The final drop is December 14, 2014 at 8:00 PM Central. 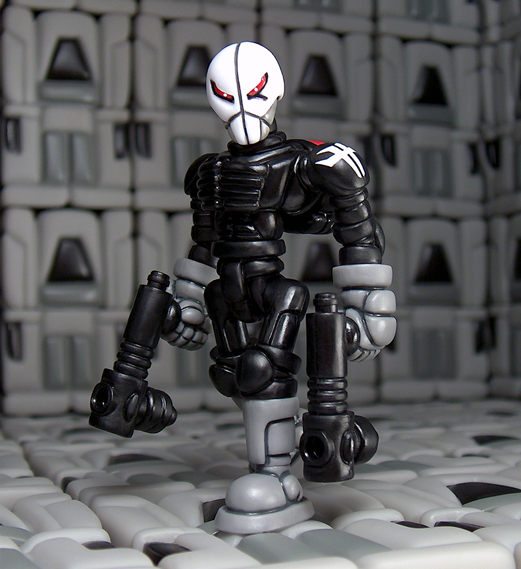 The Insectoid (pictured) and Rider are $16 each and have enhanced deco over previous releases. Another figure (not shown or specified) is also on deck. The Super Crayboth Mordireus came out a few months ago and the mostly-unpainted figure is actually quite nice. Do I need a bright pink unpainted Super Crayboth? No. Did I want one anyway? Yes. A few of this big guy got out this year, standing about 4-inches tall. For those who don't habla the Glyos, Onell Design's vinyl figures are sort of similar to a few Funko offerings. They're about the same height as the Pop! Vinyl figures and twice as wide, but are marketed similarly to the Hikari figures. (Also, Onell predated both by several years.) Basically it's a sturdy, squat figure with a low edition size and a known release date. You don't have to hunt, you don't have to pray - you just need to plan your night around them. Instagram Preview of Maxx Zeros are there for you. Pictured is the "ultimate" version, you can also click here to see the standard one. Nice! Dr. Kent promises more postings on these shortly.